It begins simply enough. Doesn't it always? A nobleman's estate needs tending in his absence. But what secrets lurk in its shadows? What deals has this man made with whispered voices in that darkness? And once such a discovery is made, can it be undone? 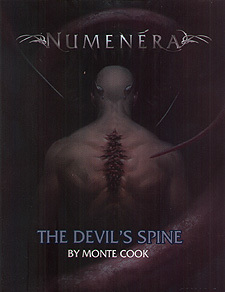 The Devil's Spine entwines three distinct adventures into a single thrilling, nonlinear story. The terrifying devil's spine graft will claim a life, and the clock is ticking. Removing it will send the characters to the depths of The Mechanized Tomb, into a web of Viral Transmissions, and ultimately off the corebook map and into uncharted territory when they go Beyond the Maelstrom. GMs can run these adventures (in any order) as a mini-campaign, or ignore the frame story and use them each as standalone adventures. They give gaming groups a taste of the fantastic Numenera setting and showcase the narrative structure of the game and its evocative world. In addition to introducing new locations not covered in the Numenera corebook, The Devil's Spine offers new creatures, characters, and items to add to any campaign.